1. The first acquaintance with felt. These lessons are intended for beginners who want to learn the process of felting on the example of amazing flower brooches. With these simple models, you will practice on different felting techniques that will be useful in future projects. 2. Fairy tales of the “Crow’s Nest”. Here you will not only be able to make your own fairytale character and invent a story to tell your child, but also to improve your wet felting skills by practicing with a small three-dimensional resist. 3. The ordinary miracle. Felting tutorials and howtos from unusual art objects, creative newborn props for photo shoots to the first experiments with kids’ clothes. 4. Felting cuisine recipes. Simple but original designs from vests to jackets and sundresses. Perfect for all those who want to practice in felting clothing. The basic patterns are presented in A4 format. They are available in scale of 1:2 to 1:6 and need to be increased to the actual size and transferred to a polyethylene film or any other waterproof template. The scale grid helps you to make it easy. The patterns are enlarged to allow for wool shrinkage. Before selecting your size, be sure to select it according to your corresponding measurements. 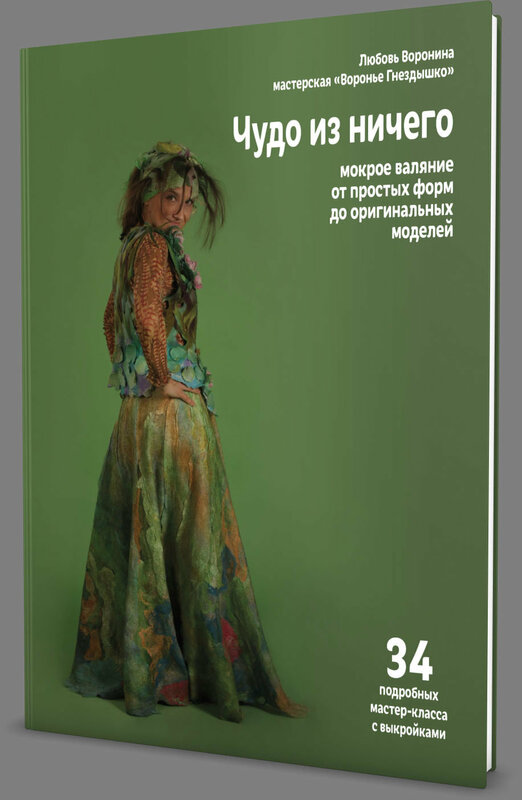 The book will be delivered via registered airmail with tracking number by Russian Post.